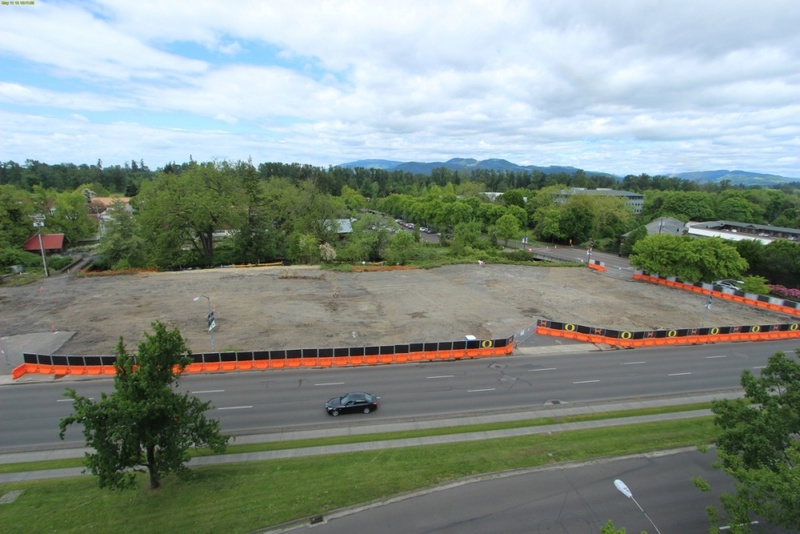 Construction on the Phil and Penny Knight Campus for Accelerating Scientific Impact is running ahead of schedule, with traffic closures and excavation set to start in comings days and weeks. The Knight Campus team has added a construction and traffic web page to keep the community informed of progress and to provide notice of potential impacts. The site now features a web cam. Sidewalks will close on the north side of Franklin Boulevard at Riverfront Parkway, with pedestrian and bike traffic redirected to the south side of the street or around a pathway north of the Millrace. Signs will be installed to assist. Starting May 20 and running through the first week of June, traffic restrictions will be in place between 7 p.m. and 6 a.m. in the area of Franklin Boulevard, Agate Street and Riverfront Parkway. Westbound traffic on Franklin Boulevard will be reduced to a single lane. This work will also close one of two left turn lanes from Agate Street onto westbound Franklin. Riverfront Parkway north of Franklin Boulevard is slated for closure during the work period, as is the left turn lane on eastbound Franklin. Traffic flows return to normal at 6 a.m. each day. During the closures, Millrace Drive can be accessed via Villard Street and Garden Avenue. The sidewalk and bicycle paths on Riverfront Parkway will have periodic closures, with a detour along the path north of the Millrace connecting to Onyx Street. Maps and diagrams illustrate the closures and details and are posted on the construction website. Mass excavation will begin on the site with large dump trucks with trailers coming and going. Excavation work should continue through the middle of July. This includes rock excavation, which is not expected to start until after commencement ceremonies. Shoring and piles will be installed to secure the sidewalls of the excavation. To mitigate extensive vibration associated with the installation of piles the construction team will employ drilling methods. In mid-June, after commencement, the west half of the parking lot north of Franklin Boulevard and west of Riverfront Parkway will close to allow for staging of construction materials and equipment. Construction and traffic updates, as well as impacts associated with the improvements being made to the Millrace, will be posted in Around the O and on the Knight Campus construction website.